On average we spend one third of our lives asleep so it’s important to make the right decision when choosing a new mattress. Make the wrong choice and you could end up suffering from poor sleeping posture which in turn can result in troublesome back and neck pain. Choose the right one however and enjoy a great night’s sleep…every night. With so many different types of mattress available, deciding which one to pick can seem a daunting task. Here at Physio Supplies we know that sometimes you need a little extra help choosing the product that’s right for you so we have put together our definitive guide to help. 1 Spring or foam mattress? Which should I choose? 2 Why choose an open spring mattress? 3 Why choose a pocket spring mattress? 4 What is a memory foam mattress? 5 And what is a mattress topper? Spring or foam mattress? Which should I choose? Choosing a mattress to suit both your body and your budget can be tricky. A good mattress can last up to 10 years so we would always recommend spending as much as you can afford when deciding on a new one. There are many options available ranging from the more affordable open and pocket spring mattresses right through to the more costly memory foam and latex options. Then there are toppers to consider…need some help? Then look no further! Why choose an open spring mattress? Open spring mattresses are probably the most affordable mattress on the market. Border rod or wire gives the mattress a firm edge and help to retain the shape. These mattresses feature a single spring construction, the springs being connected by a single length of wire. The springs do have a tendency to respond and react to body movements as one, thus you will be acutely aware of your partners movements during the night. For a ‘no-frills’ budget option however, open springs mattresses are a great choice. Why choose a pocket spring mattress? Whilst still very affordable, these mattresses are much more luxurious than their open spring contemporaries. Pocket sprung mattresses consist of small individual springs sewn into individual fabric ‘pockets’. These springs work independently to respond to your individual body weight. They are extremely responsive whilst minimising the risk of rolling towards your partner during the night. These are the most popular type of mattress by far. Most popular choice. Long life-span. Memory foam mattresses have become extremely popular in recent years. 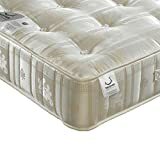 This is mainly due to the ability of memory foam to provide great support while helping to maintain correct posture and spine alignment as you sleep. Memory foam moulds itself to your body’s contours providing support and enabling natural movement during sleep. Although more expensive than sprung mattresses, the memory foam options are both hypo-allergenic and boast additional anti-microbial properties. Another option is to choose a latex mattress. These, like the memory foam mattresses are hypoallergenic and extremely durable. They provide more elasticity than the memory foam options but can also be expensive. And what is a mattress topper? A mattress topper adds an extra layer of padding to your existing mattress. A topper fits on top of your mattress to provide a luxurious extra layer for additional comfort and support. 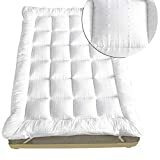 Use of a mattress topper will enhance the comfort of your existing mattress. Toppers are available in all UK standard sizes and in a choice of materials including feather and down, memory foam and manmade fibre. Hopefully our guide has helped steer you in the right direction when it comes to choosing a new mattress. If you would like to read more about the importance of a good mattress and how it can help your posture then take a look at this article from Spine-health.